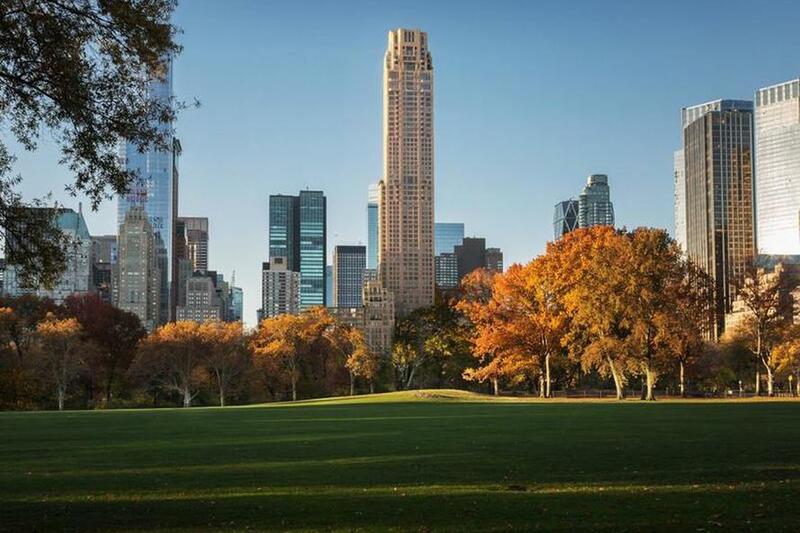 Step aside 15CPW, 432 Park and One57th: New York City’s 220 Central Park South is now considered the city's most exclusive and expensive new residential development. Sitting on the south end of Central Park, it is also starting to garner a reputation as one of the most secretive places to live: its developer has not released images of the unit interiors and the chief executive of the tower refuses to take interviews about it, according to a new Wall Street Journal article. However, an offering plan that was filed with the attorney general's office reveals that sale prices for the property's units are going to range from about $12 million to $250 million and the list of some of the buyers - no longer hidden behind anonymous LLCs - is also starting to leak out; it includes Daniel Och, who is chairman of Och-Ziff capital management. Other on the list are Andrew Zaro, chairman of Cavalry Portfolio Services and his wife, and Ofer Yardeni, CEO of Stonehenge Management, is also said to be on the list of buyers. Musician Sting and his wife are also set to be buyers. Hedge fund manager Ken Griffin has also contracted to spend more than $200 million on apartments in the building. If Griffin decides to combine these apartments, the resulting unit could be "the most expensive home ever sold the United States". Still, it wasn’t immediately clear how much any of these prospective buyers actually paid for the units and whether there were any price adjustments. Many of the contracts for these purchases date back to 2015, a time when the Manhattan real estate boom was in full swing and a money-laundering haven for offshore oligarchs. Many of these contracts are closing only now as the building is finishing completion. Prospective buyers either declined to comment or couldn’t be reached by the WSJ, and representatives from Vornado Realty Trust, the company that is responsible for building the tower, didn’t have any comment. Since then, Manhattan's real estate market has slowed down significantly. One real estate agent, Frances Katzen, said she hopes that the closing of these units will help bolster the real estate market in Manhattan yet again, despite the fact that many of the contracts are from three years ago. Meanwhile, real estate agents are already predicting that the building will set the record for the highest price per square-foot ever obtained for New York City apartment. The previous record was held by 15 Central Park West, which in 2012 sold for $13,000 a foot when Sandy Weill sold his penthouse for $88 million. Donna Olshan of Olshan Realty disagrees that the building could sway the barometer for the market. “This building cannot be considered a proxy for the market. It’s its own country,” she told the Wall Street Journal. 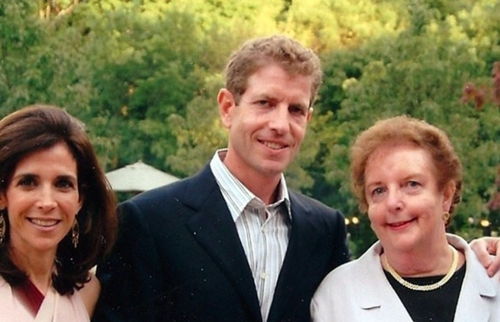 In selling units at 220 Central Park South, secrecy was the right strategy at the time. In 2015, during the midst of the Manhattan real estate boom, keeping things secret instead of touting amenities proved to be a successful strategy in attracting the attention of the tragically hip "savvy" deep pocketed buyers. Whether or not the same strategy would work in 2018 is another story. “What used to work in those markets does not work now,” Donna Olshan continued. People familiar with the building have stated that the building includes private dining rooms, an athletic club, a juice bar, a library, a basketball court, a golf simulator and a children’s play area. The building was designed by Robert A.M. Stern, who also designed 15 Central Park West; the building real estate agents most frequently compare 220 Central Park South to. 15 Central Park West has itself has attracted numerous billionaire and celebrity buyers since it was erected in the mid 2000's. Daniel Och also owns a unit in that building and Sting recently sold his unit there for $50 million. 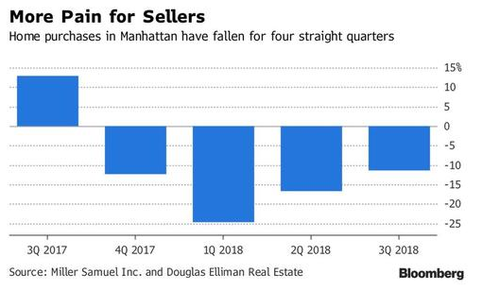 Meanwhile, away from this bastion of extravagant opulence things are slowing: one month ago we reproted that the Manhattan luxury market was experiencing a rout. When the first signs of stress in Manhattan's luxury real-estate market started to appear roughly one year ago, we anticipated that the weakness in the high-end would soon spread to the broader market. In early October, Bloomberg reported that during the three months through September, the number of homes purchased in Manhattan declined for the fourth straight quarter, dropping 11% from a year earlier to 2,987, according to a report Tuesday by appraiser Miller Samuel Inc. and brokerage Douglas Elliman Real Estate. Meanwhile, the number of listings climbed 13% to 6,925 homes, the most since 2011. So in retrospect, those looking for the "top tick" in the Manhattan real estate market, perhaps the days when the ultra-wealthy new buyers at 220 Central Park South were putting pen to paper in 2015 should be a great place to start.